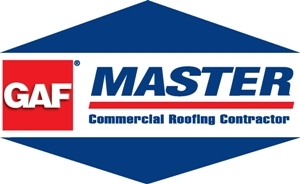 As GAF Master® commercial roofing contractors, we have come to appreciate the wide selection of roofing products that GAF has to offer. When we are facing a challenge, they always have a solution. 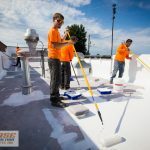 Today we are wanting to acknowledge their silicone coating solutions, specifically the United Coatings™ Unisil HS Roof Coating. 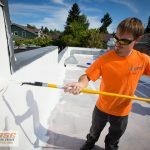 Instead of replacing your roof – coat it! Replacing your roof can be a huge ordeal. You may have to shut down operations, losing even more money, and putting even more strain on the business. 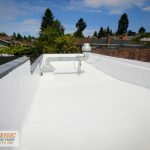 Because of that reason, more and more companies are choosing to go with a coating instead to extend the life of their roof. Tenants can stay and business can be conducted as usual while the coating is being applied. 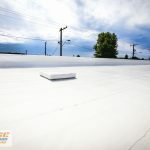 Unisil HS Roof Coating is an ultra-high solids elastomeric silicone coating, providing superior weatherproofing, ultraviolet resistance, and fire resistance to extend the life of new and existing roof substrates. 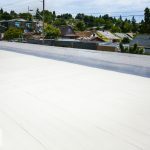 Resistant to algae, mildew, and mold growth, this coating also has a quick moisture resistance to rain giving building owners and contractors peace of mind. And it’s flexible! After 5,000 hours of exposure, it is proven to have continued flexibility. A test proves that the coating retains its ability to withstand multiple mandrel bends at 2°F (-17°C) without cracking. 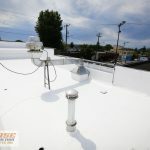 LET US COAT YOUR ROOF! We have a passion for roofs, and with our elite status, we are fortunate to work on all types! You can be confident to know that when we complete your roofing project, you are getting a quality roof! So if you are looking to revamp your old roof with a coating, or wanting to a new roof completly, we are the company for you! Call today to schedule your free estimate 253.445.8950, or fill out our quick estimate form! We look forward to working with you!